Curtis Koldeway joined our staff in 2014. He started his architectural career in 2003 at Front Range Community College. He received an associates degree in architectural engineering and construction technology, emphasizing drafting and the computer programs that firms utilize in architecture. While still a student at FRCC Curtis worked for 5 years completing a wide variety of building types from residential to K-12 projects. Curtis continued his education journey working through undergraduate school at University of Colorado Boulder where he received a Bachelors in Environmental Design emphasizing Architecture and then graduating with a Masters in Architecture from the University of Colorado Denver. 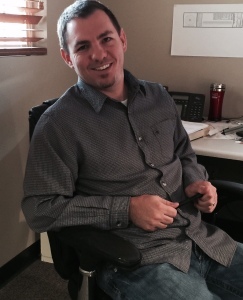 Curtis also worked two years at an architectural firm in Denver specializing in large multi-family projects. As a member of the staff at Hauser Architects Curtis works with clients from schematic design to the detailing in constructions documents. Curtis has participated in a variety of projects at Hauser including the Pediatric Urgent Care in Timnath, High Plains Environmental Center in Loveland, Raw Urth Building in Fort Collins and the Esh Market in Loveland. He has an expertise in storage projects along the Front Range. Curtis has been the Project Manager on several storage facilities including facilities located in Loveland, Fort Collins, Greeley, Northglen, Erie, Brighton and Greeley. Curtis is a lifetime resident of Loveland and has a wife and 2 children. He volunteers with the Habitat for Humanity program introducing sustainable low income housing to Habitat homes in Loveland.